1 sliced courgette – not a massive one! Rinse the rice until the water runs more or less clear. Leave it soaking in water while you get everything else ready. Heat oil in a large pan or a wok (one that has a lid). Add whole spices – cinnamon, bay leaf, cloves, cardamom and peppercorns. Fry 1 minute. Add onion and fry for another 2 mins. Lower heat and add ginger, garlic, chilli powder, garam masala and ground coriander, followed by the vegetables (not the beans). Stir fry for 2 -3 mins and then stir in the yoghourt. Drain the rice and add it with the beans to the pan. Mix well very gently so rice doesn’t break up. Add salt to taste (none is fine!) 1 tbs of the coriander leaves, red chillies, lemon juice and 3 cups of water. Cover pan with a lid and turn heat down to lowish. Cook until water is absorbed, without stirring — about 15 mins). Let the pilau rest for about 5 mins off the heat, then garnish with the rest of the coriander leaves. 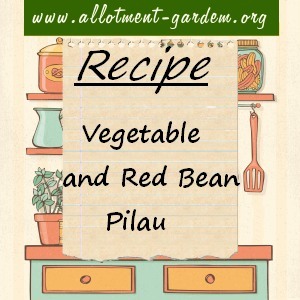 This Vegetable & Red Bean Pilau recipe makes a deliciously different, low-calorie one-pot meal.